Happy Mother’s Day!! This is a gift box that one of my talented customers Annie made for her Daughter’s Mother’s Day present!! Beautiful! Annie used the Fresh Prints designer paper from the Occasions catalog with Read Red and whisper white card stocks. 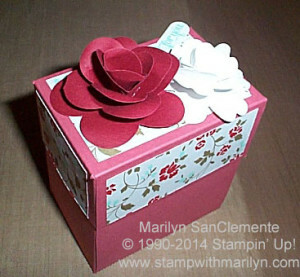 I thought the rose on the top of the box was made with the flower die in the Occasions catalog but Annie tells me that it is punches that have been layered. She found the pattern for this box on Poodlescraft You tube channel. I have such talented customers! Enjoy your day everyone! I will be driving down to CT to pick up my daughter. Hard to believe that her freshman year at Sacred Heart is almost over! It seems like yesterday that we dropped her off.